Do you need a helping hand getting started with email marketing? 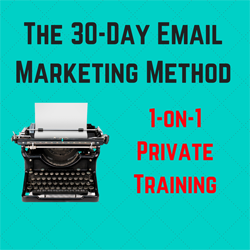 If you already have a product or service and one help drafting your 30 day email campaign this session is for you. We will analyze your product and your market and help you write the messages that will convert your audience into paying customers. If you are planning a new initiative and want us to set up the automation mechanism to create your hands-free marketing machine we can help. A six hour session is all you need to move your plan from dream to reality.